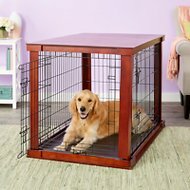 At Chewy, we realize how important your four-legged furry friend is to you, therefore we only sell the best in dog supplies, including dog food, dog treats and dog toys. 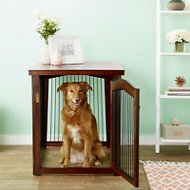 If you've been searching for furniture style dog crates, pens & gates, look no further. Among the wide selection we carry, one option to try is Merry Products. Key benefit: easy to set up with slide-fit wood panels, with no hardware or tools needed. 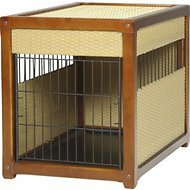 Another product is Mr. Herzher's Original Wicker Pet Residence, Dark Brown. 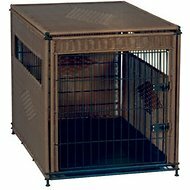 Key benefit: thoughtful, easy assembly ensures tight and rattle-free fit and protective, no-slip feet raise entire residence off floor. 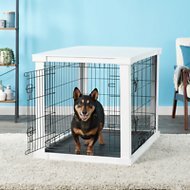 Chewy carries a wide selection of dog supplies to cater to your dog's wants and needs. You'll only find best in product for dog food, dog treats, and other dog supplies! 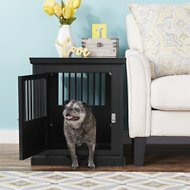 For all your pet needs including furniture style dog crates, pens & gates, Chewy has you covered! We're here for you.